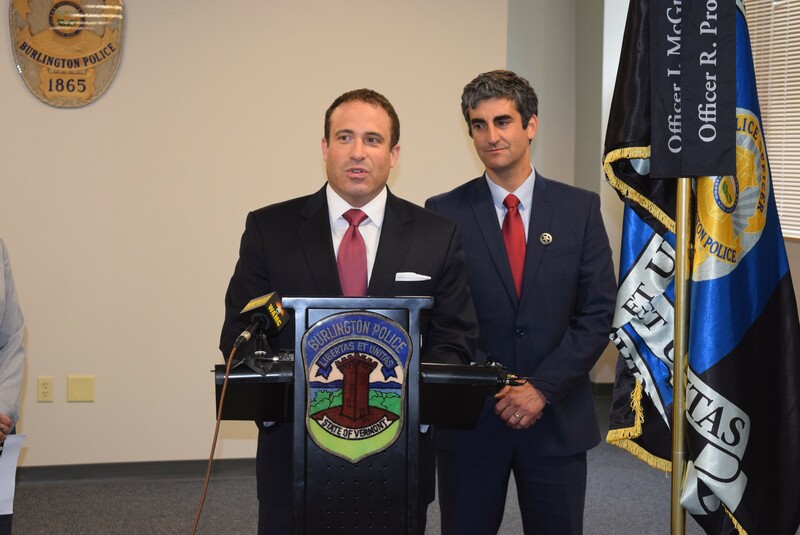 Brandon del Pozo (left), newly appointed as Burlington's next police chief, speaks Tuesday after being introduced at a press conference by Mayor Miro Weinberger (right). Hours before Brandon del Pozo was introduced to the media Tuesday as Burlington’s next police chief, he got a taste of how local residents might react to his appointment. He was standing outside a house on South Union Street that he and his family hope to buy. After witnessing a woman fall, he dialed 9-1-1 and later introduced himself to one of the first responders. “You’re the guy up from New York City,” the responder told him. That guy from New York City is Mayor Miro Weinberger’s choice to serve as police chief of a municipality smaller than most New York City police precincts. If the Burlington City Council approves his appointment Monday, he will replace recently retired police chief Michael Schirling on Sept. 1. The 40-year-old del Pozo spent the entirety of his 18-year police career there, starting as a patrol officer in his native Brooklyn and working his way up to deputy inspector. “It is a huge plunge to go from a life that you've lived and a profession you've been in for 18 years in a big agency and come to what feels like — to my father, who's from Cuba, this feels like a very, very far away place,” del Pozo said at an afternoon news conference. But the 1996 Dartmouth College graduate has a varied background and Vermont ties. He said he “always envisioned” living and working in Burlington. He came here in 1998 to work at the U.S. Army Mountain Warfare School in Jericho. He and his wife, Sarah, returned to the city for their first wedding anniversary. In a 2002 New York Times Style section story about their wedding, del Pozo said he and his wife shared an affection for Vermont's own Magic Hat #9. The article noted that he had his sights set on a top post in the NYPD. At Tuesday’s news conference, del Pozo cited the Sept. 11, 2001, attacks as an important moment in his police career. “It was a very humbling day to be a cop,” he said. Weinberger chose del Pozo from about 30 applicants, including eight who were interviewed by a 20-member search committee. Four became finalists, including at least one internal candidate. Weinberger said del Pozo was the “consensus pick,” but that the decision was his as mayor. Sarah Kenney, chair of the city Police Commission and a member of the search committee, said the New Yorker “impressed” a group that is not easily impressed. Del Pozo stood out for his leadership experience, including four years as a precinct commander, and for his innovative spirit, Weinberger said. Along with his bachelor’s degree in philosophy, del Pozo has three master’s degrees and is working on his doctorate. He spent several years working for the NYPD’s intelligence division, including an assignment collecting and analyzing intelligence in the Middle East from a post in Amman, Jordan. In various roles with the department, Weinberger said, del Pozo showed an inclination to reach out to under-represented communities. “He’s bright. He’s been tested. He’s ready to be chief,” Weinberger said. Burlington City Councilor Sara Giannoni interviewed the finalists. She said del Pozo cited examples of reaching out to gay communities and handling protesters. She said he would go out on patrol with officers. Pending approval of the City Council, Del Pozo will be paid $114,363 a year to oversee 100 police officers and nearly 40 civilian employees, according to the mayor. Del Pozo said that by leaving the New York Police Department just shy of 20 years, he gave up $12,000 a year for life. “That and the house on South Union Street, if all goes well, is the price I have to pay to come to Burlington,” he said.